As you might already know I'm an avid biker. I like to take long bike rides and if the weather is nice (no snow or rain) I bike to the train that gets me into the City. You can see my bike below, it is about half my age and I already rode it to high school because there were no school buses and the closest public transit bus station was about a 15 minute walk away. Getting to school on my bike took 15 minutes so it was the most feasible option, provided there was no snow or epic downpour. I love the basket that is on my bike in the photograph but sadly the bike fell over one day and the basket broke. Since then I have been on the hunt for another basket. I would also like to introduce some color to my bike so the yellow milk bottle basket (11) would be perfect. Or should I go for the cute handlebar bag (9) that is made out of vintage upholstery fabric? Or keep looking? How do you commute to work? Do you take a car, train, bus or can you walk to work? Or maybe you have to do a combination of different means of transport? Remind me to tell you about my Konstanz episode called "Why I will probably never be able to ride a bike again" the next time we meet ;-) Sorry to hear about your basket though as it is/was a very nice touch. I thought I saw in one of your pictures that you have #3- I thought that was a cute touch too (or am I making this up). He he I love the "I love my bike" bell! I think the milk basket looks good, but all smallish items will fall through the gaps, like the tyre pump. I'd love to bike to work, but my commute is 55 km one way, I'd also love to use public transport, but it would take me 2 hours one way and it only takes me 45 minutes with a car. I hate that we now have two cars. If we ever deside to move we should really investigate where so we would not need two cars. I like the milk bottle basket, partially because it is a cheery yellow! rooth, yes, the yellow makes me happy too! I do a combination drive/ride with/on my folding bike. My commute is too far for me to ride the whole way, so I do a sort of park and pedal. For just running errands, I take the bike unless I'm planning a BIG trip at the grocery store. 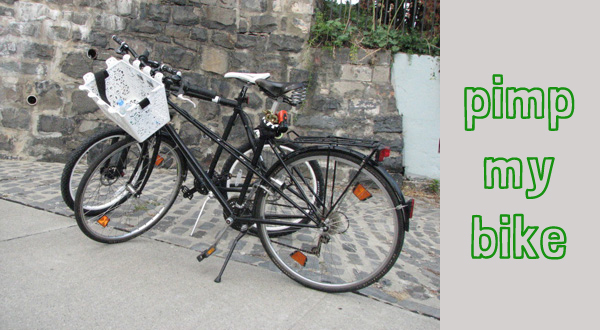 I have a couple of those collapsible metal mesh baskets on a rear rack. I like them because when I'm not carrying anything, I can just close them and they don't slow me down when I'm riding. They also don't get in the way of the folding - but I don't imagine you'll have that concern. No. 10, No. 10! :) Gosh, that basket is so pretty and intricate. I think my daughter's music teacher has that same basket on her bike. I love it. Check out that cool seat in #2. Oh, I am definitely loving how your pimping your ride. We do a combination of walking and biking. Though, we don't have that far to go, about a 1/2 mile. Have a great weekend, Nina. Hope you get to do some riding and enjoy the weather. Loved this post! Unfortunately I commute into central London by train (sometimes tube), AND bus! It’s the absolute worst part of my day. Service is notoriously bad and last week, it took me over 2 hours to get home. I have been toying with the idea of cycling for ages now but the London traffic really intimidates me. I guess one day I will just have to bite the bullet and give it a go – and after seeing your cute little bike, I am more determined than ever! I really love the milk bottle basket! Leah, I saw the cute bike on Instagram. What a great deal too!